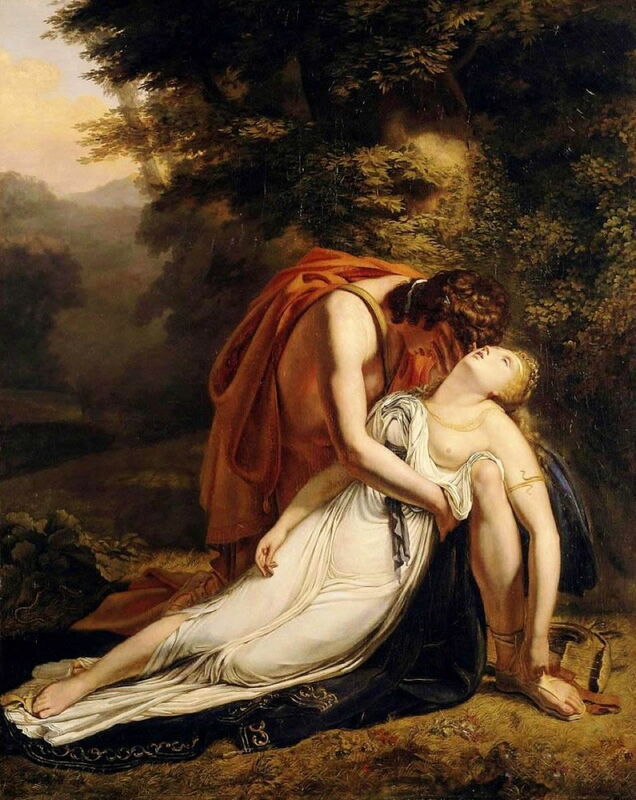 Ary Scheffer (1795–1858), Orpheus Mourning the Death of Eurydice (c 1814), oil on canvas, dimensions and location not known. Wikimedia Commons. Ovid ended Book 9 of his Metamorphoses with some myths which posed painters problems, but opens Book 10 with one of the greatest and most enduring stories of the European canon: that of Orpheus and Eurydice. Ovid links to this story through Hymen, the god of marriage, and the wedding of Eurydice to the outstanding musician and bard Orpheus. 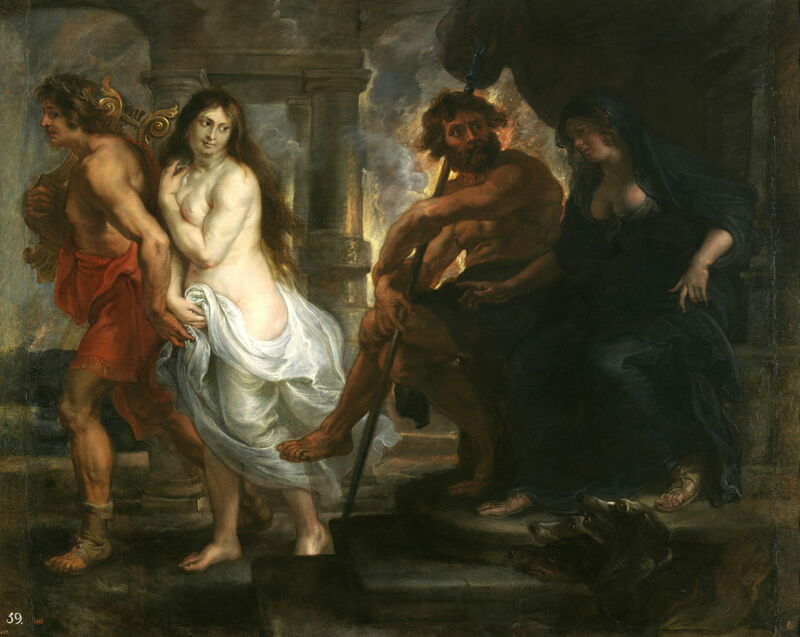 It was a wedding marred by tragedy: after the ceremony, as Eurydice was wandering in joy with Naiads in a meadow, she was bitten by a snake on the heel, and died. Orpheus was heart-broken, and mourned her so badly that he descended through the gate of Tartarus to Hades to try to get her released from death. He came across Persephone and her husband Hades, and pleaded his case before them. He said that, if he was unable to return with her to life on earth, then he too would stay in the Underworld with her. He then played his lyre, music so beautiful that those bound to eternal chores were forced to stop and listen: Tantalus, Ixion, the Danaids, even Sisyphus paused and sat on the rock which he normally tried to push uphill. The Fates themselves wept with emotion. Persephone summoned Eurydice, and let Orpheus take her back, on the strict understanding that at no time until he reached the earth above could he look back, or she would be taken back into the Underworld for ever. The couple trekked up through the gloom, and were just reaching the brighter edge of the Underworld when Orpheus could resist no longer, and looked back to make sure that his wife was still coping with the journey. The moment that he did, she faded away, back into Hades’ realm. As he tried to grasp her, his hands clutched at the empty air. She was gone. Orpheus tried to persuade the ferryman to take him back across the River Styx into the Underworld, but was refused. For a week he sat there in his grief. He then spent three years avoiding women, in spite of their attraction to him, and brought shade to an exposed meadow, with his singing – which leads on to the next myth. This story, and its well-known earlier telling by Virgil, has been most popular with composers, writers, and painters, even up to the present. Although I show ten paintings below, they are a small selection of what I think are the very best. Jacopo da Sellaio (1441/1442–1493), Orpheus, Eurydice and Aristaeus (1475-80), oil on panel, 60 × 175 cm, Museum Boijmans Van Beuningen, Rotterdam, The Netherlands. Wikimedia Commons. The earliest painting in the post-classical era which I have been able to trace is Mantegna’s ceiling fresco in the Palazzo Ducale, Mantua, from 1468-74, but this superb panel by Jacopo da Sellaio, showing Orpheus, Eurydice and Aristaeus dates from just after that, in 1475-80. This is one panel of a series, which is sadly now dispersed across continents. It employs multiplex narrative to show the start of the story, with Orpheus left of centre, tending a flock of sheep, as his bride is bitten by the snake. 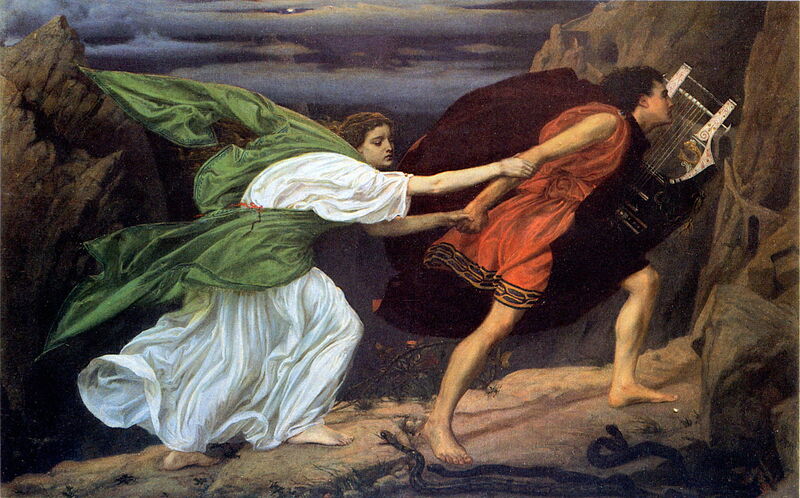 At the far right, Orpheus, with the assistance of Aristaeus, puts the dead body of Eurydice in a rock tomb. 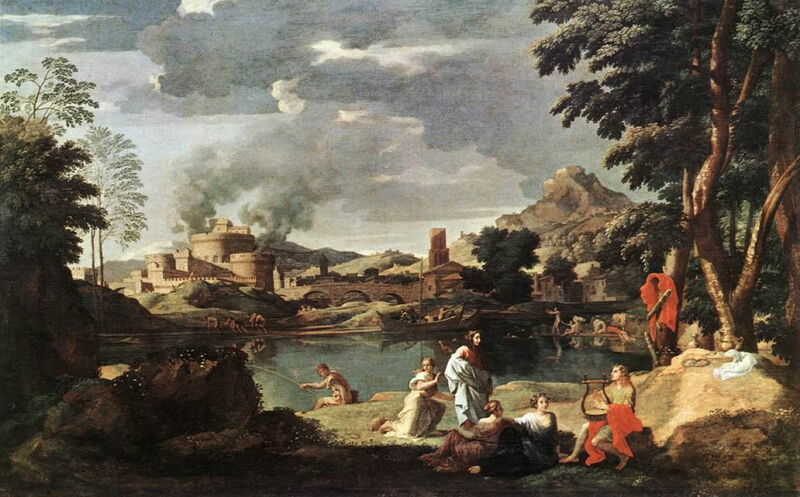 Nicolas Poussin (1594–1665), Landscape with Orpheus and Eurydice (c 1650-53), oil on canvas, 149 x 225 cm, Musée du Louvre, Paris. Wikimedia Commons. One of Poussin’s most famous narrative works, Landscape with Orpheus and Eurydice (c 1650-53) shows Orpheus, with his lyre at the right, and Eurydice standing in white, as a snake approaches from the left. Poussin had a thing about snakes, and painted other landscapes with snakes threatening people, and his enigmatic Landscape with a Man Killed by a Snake (c 1648). Here his normally peaceful rustic landscape is showing ominous signs of falling apart: the distant castle is on fire, with smoke billowing into the sky. Ary Scheffer’s moving painting of Orpheus Mourning the Death of Eurydice was one of his early works made in about 1814. The snake is still visible at the far left, and Orpheus cradles the limp body of his new bride, and breaks down in grief. Scheffer’s handling of complex limb positions is masterful, with the symmetry of their right forearms, and the parallel of her left arm with his left leg. Orpheus’ lyre rests symbolically on the ground behind his left foot. 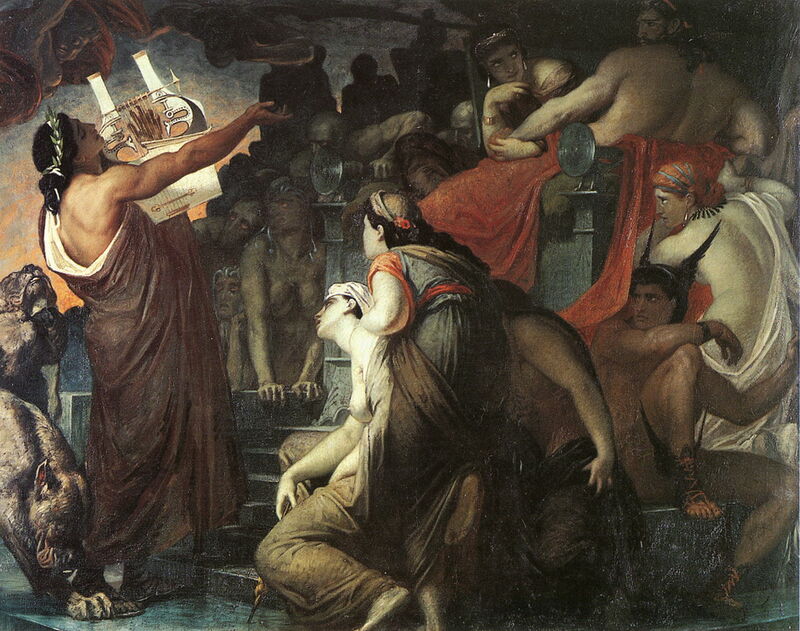 Henri Regnault’s Orpheus in the Underworld (1865) was probably more based on the popular opera by Offenbach, which was first performed in 1858. Orpheus is seen at the left, his lyre in his hand, singing to the dead. Behind him, at the left edge, are two of the heads of Cerberus, who guards the entrance to the Underworld, and sat on the double throne at the upper right are Persephone (who only spends half the year in the Underworld), and Hades himself. Peter Paul Rubens (1577–1640), Orpheus and Eurydice (1636-38), oil on canvas, 194 × 245 cm, Museo Nacional del Prado, Madrid, Spain. Wikimedia Commons. Rubens’ atmospheric painting of the flight of Orpheus and Eurydice (1636-38) was made during his later years of retirement, not long before his death. Orpheus, clutching his lyre, is leading Eurydice away from Hades and Persephone, as they start their journey back to life. Unusually, he opts for a real-world version of Cerberus at the bottom right corner. 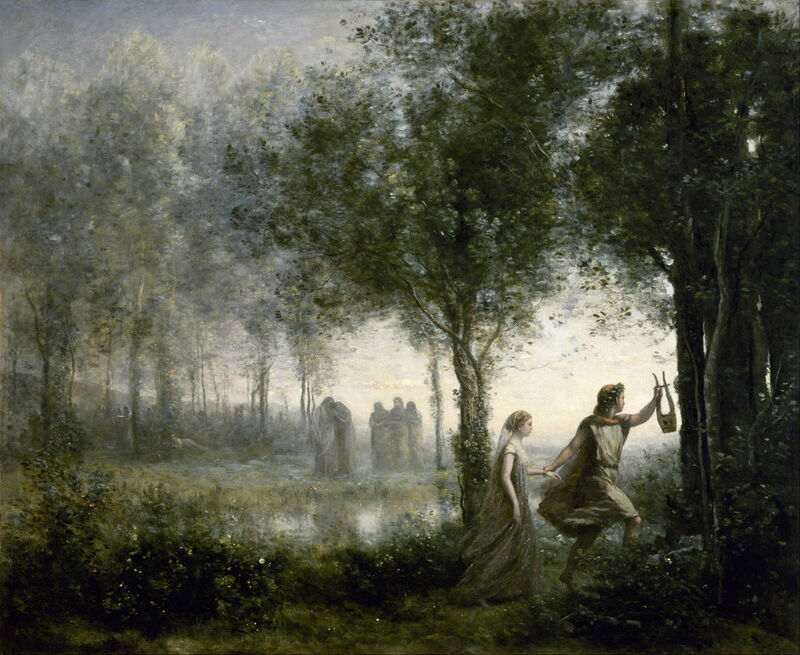 Jean-Baptiste-Camille Corot (1796-1875), Orpheus Leading Eurydice from the Underworld (1861), oil on canvas, 44 x 54 cm, Museum of Fine Arts, Houston TX. Wikimedia Commons. Corot’s Orpheus Leading Eurydice from the Underworld (1861) shows the couple as they near the light at the exit of the underworld. Orpheus is instantly recognisable by his lyre, held high in front of him, and both are clearly moving towards the right edge of the painting, the edge of the dark wood. Rather than use an abstract form to represent the underworld, Corot has used a wood, with a pool in the middle distance. Behind that are spirits of the dead, some still grieving their death. Edward Poynter’s Orpheus and Eurydice (1862) takes the couple on an arduous journey, striding past snakes and along a dizzying path on the mountainside. Whilst he looks straight ahead, she seems to be struggling to keep up. John Roddam Spencer Stanhope (1829–1908), Orpheus and Eurydice on the Banks of the Styx (1878), oil on canvas, dimensions and location not known. Wikimedia Commons. 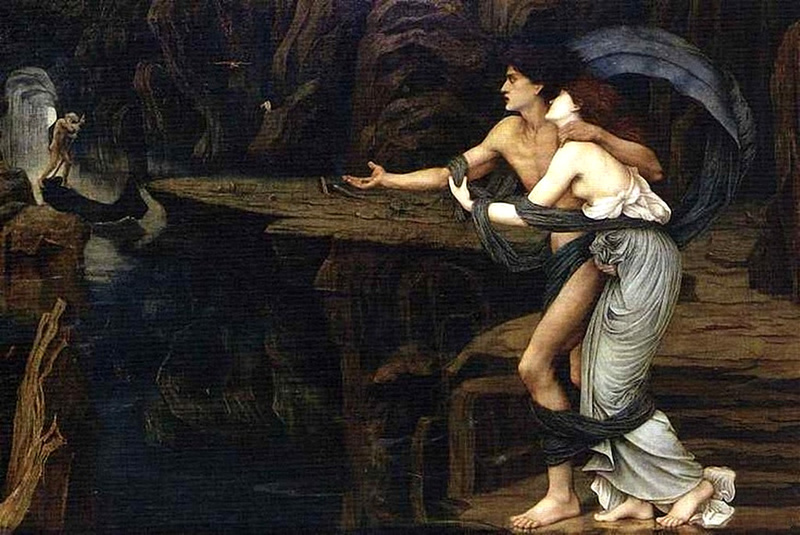 John Roddam Spencer Stanhope’s Orpheus and Eurydice on the Banks of the Styx (1878) takes the couple further still, onto the bank of the River Styx, where Orpheus is summoning Charon the boatman to take them back across the water. He clutches her closely and still looks straight ahead, the couple bound together by the black sash of the Underworld. George Frederick Watts (1817-1904), Orpheus and Eurydice (date not known), oil on canvas, 56 x 76 cm, location not known. Wikimedia Commons. 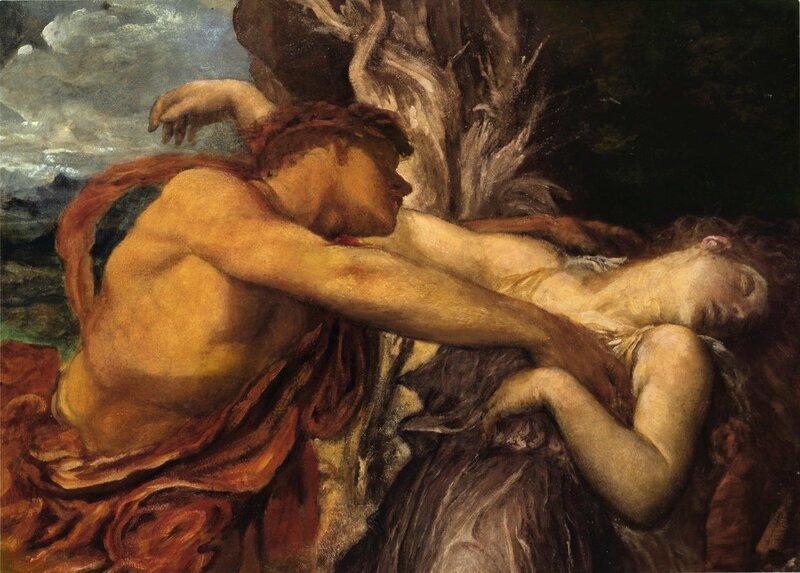 It is hard to know whether George Frederick Watts’ undated painting of Orpheus and Eurydice shows Orpheus embracing the dead body of Eurydice immediately after she has been bitten by the snake, or (I think more probably) Orpheus clutching in vain at her spirit as it melts away back into the Underworld, after he has looked back. 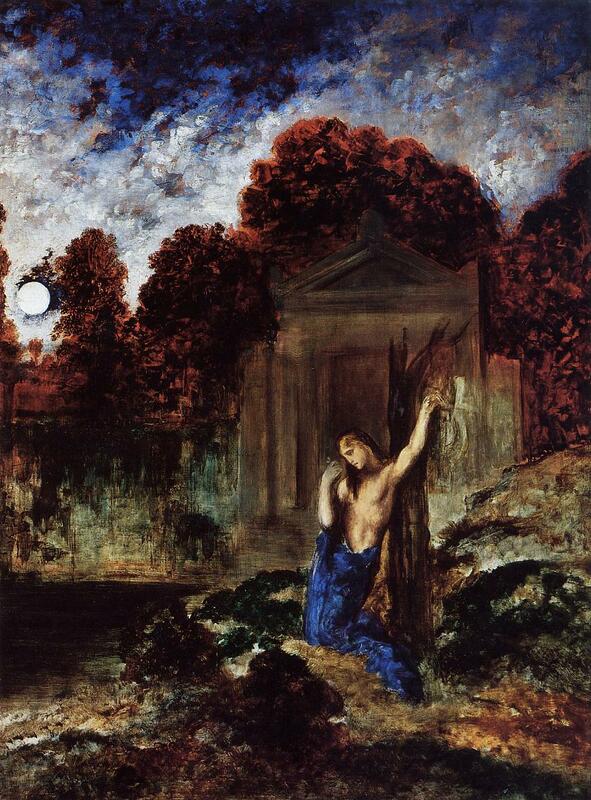 The final painting in this series is Gustave Moreau’s Orpheus at the Tomb of Eurydice (c 1891), showing the bard, his ghostly lyre slung from the dead treestump behind him, lamenting the loss of Eurydice after his failed attempt to bring her back from the Underworld. Moreau painted this dark and funereal work to mark his own inconsolable grief at the death of his partner, Alexandrine Dureux. I am sorry if I omitted your favourite painting of this wonderful story, but hope that you enjoyed this selection, which spanned over four hundred years of fine art. Posted in General, Language, Life, Painting and tagged Corot, da Sellaio, Metamorphoses, Moreau, myth, narrative, Orpheus, Ovid, painting, Poussin, Poynter, Rubens, Scheffer, Stanhope, Watts. Bookmark the permalink.